What did St. Ignatius have to say about the role of the Bishop in the Church. Listen to the first half of Fr. Andrew's fourth talk in this series. On this Sunday of the Forefeast of the Transfiguration, Fr. Andrew asks if we have the will to become "All Flame." On this Sunday of the Cross, Fr. Andrew discusses what it really means to 'Take Up the Cross'. On this Sunday, Fr. Andrew discusses what Saint Paul defines as the ecstasy within the Church. On the feast of St. Sisoes the Great, Fr. 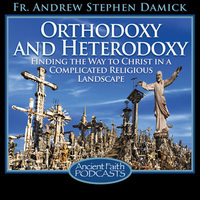 Andrew comments on how St. Sisoes was able to understand both death and life through the story of the Holy Scriptures.